After a few relatively calm minutes of exposition in London, Bond is dispatched to follow up on a lead in Haiti where he engages in a deadly knife fight, motorbike chase, and – ultimately – a motorboat chase. All that remains is an air chase and, don’t worry, that’s coming later. Louise wanted to keep Daniel’s casual wear almost like a uniform. So for example, the most published photos are in the blue jacket and jeans. All the casual outfits are a variation on this. The mentioned blue jacket and jeans were worn with a polo and chukka boots during the film’s climactic action scene in Bolivia. Earlier in the film, Bond indeed wears a variation of this, also sporting a dark polo, dark jacket, and chukka boots with jeans – although these jeans are a dressier pair of cream jeans more appropriate for a warm summer day in the Caribbean climate. Matt Spaiser also wrote an extensive breakdown of this classy casual outfit on his blog, The Suits of James Bond. 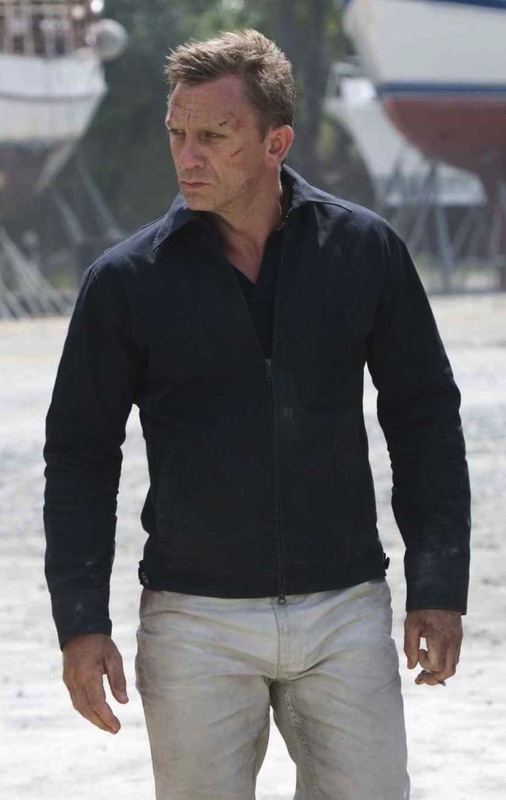 Bond wears a black Tom Ford short-sleeve polo shirt designed similarly to the popular blue Sunsel polo that Daniel Craig had worn in Casino Royale. The fine cotton pique knit shirt has a two-button placket, worn unbuttoned, and a breast pocket with a rounded-bottom. The shirt has a short fit with two short vents on each side that separate the slightly longer back from the shorter shirt front. Edmund Slate shows no respect for a fine shirt. The shirt’s color, specifically whether or not it is black or a dark navy blue, is debated by some. The Rittenhouse Archive costume cards, specifically card QC22, would seem to answer this question. The cards have been posted to the AJB007.co.uk forum, and one is still available on eBay as of August 6, 2015. Given this information, I’m sticking to my guns with my belief that the shirt is black. The costume cards for this outfit’s shirt, pants, and jacket. What do you think? Black or blue? After Edmund Slate so rudely slashes Bond’s shirt (and his torso), Bond is forced to clean himself up before heading back into public. Luckily for him, Slate is a man of style who happens to wear the same size clothing as 007! 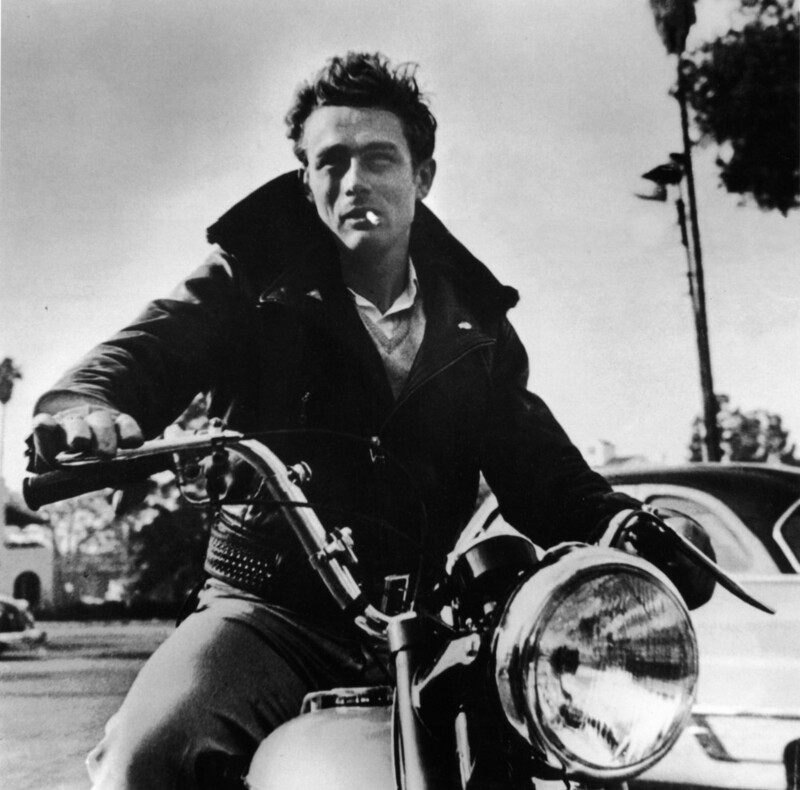 In Slate’s closet, Bond finds a black polyester motorcycle jacket that zips over the bloodied polo to hide any evidence of the fatal fight. In addition to the zip front, the jacket has a large shirt-style collar, vertical welted hand pockets, and set-in sleeves. The cuffs close on a single button, and there is a small tab on the right and left sides of the waistband that adjusts the fit on one of two buttons. The jacket is reportedly from Y-3, Yohji Yamamoto’s fashion line with Adidas, with style number #609980 eventually representing the Quantum of Solace jacket on the market for a brief time in late 2008. Bond’s jacket was slightly modified from the commercially-available version with the Y-3 logo on the back right shoulder hidden or removed and the left collar tab folded back. According to some, the waist-length jacket is actually made of Gore-Tex, a lightweight, waterproof fabric designed to be worn in all weather to repel rain while absorbing water vapor. (The scientific name for Gore-Tex is polytetrafluoroethylene – or ePTFE – and it was co-invented by William L. Gore and his son Bob in 1969.) Whether Bond’s jacket is truly Gore-Tex or not, it’s almost certainly constructed from a synthetic waterproof poly-fiber. Daniel Craig Without a Cause. Although some questions surround the manufacture of the shirt and jacket, Bond’s pants in Haiti have been widely confirmed to be a pair of cream-colored Levi’s 306 STA-PREST jeans. Unlike traditional denim jeans, the 306 STA-PREST jeans are a diagonally-ribbed twill weave in a cotton and polyester blend. The non-stretching qualities of the strongly-woven blend keep the slim fit and tapered legs intact and free of wrinkles to complement Dan Craig’s muscular physique. After his deceptions and deadly fights on site, poor Bond was probably banned from the Hotel Dessalines. The now-discontinued cream color was only available in the U.K. and Belgium, according to Campbell’s post, where he states that they are “as told to [him] by Louise and David Zaritsky – Levi’s 307 STA-PREST trousers (almost a chino style trouser) in cream.” Campbell accurately describes the STA-PREST jeans as resembling chino trousers, and the most obvious visual differentiation is the STA-PREST’s jean-style five-pocket layout including two angled slash front pockets, right side coin pocket, and two back patch pockets. More information about the cream Levi’s from Quantum of Solace is available at James Bond Lifestyle. Bond wears the same Prada 2c 4099 2 belt with these pants as he does later with his blue jeans in Bolivia. The belt is made of black cross-hatched Saffiano leather, a texture characteristic of both Prada and Ferragamo belts according to James Bond Lifestyle, and it closes through a square steel single-claw buckle. 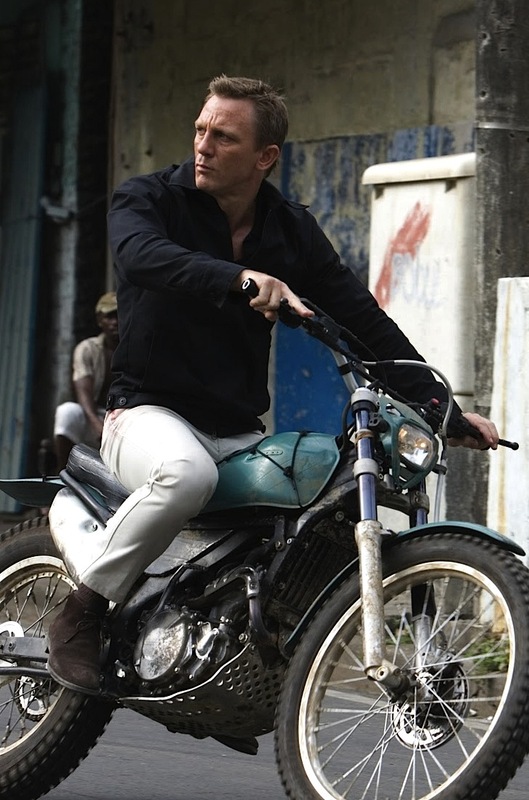 Bond also wears the same shoes as he wears later in Bolivia, a pair of dark brown sueded leather Church’s Ryder III chukka boots with two lace eyelets and Dainite® studded rubber soles that give him extra traction when running from motorbike to motorboat. He wears these boots with a pair of brown ribbed cotton socks that flow nicely from the boots up the legs. These chukka boots appear to be Bond’s casual footwear of choice in Quantum of Solace. As Frogley told Campbell: “The Church’s Ryder III brown desert boots are the ONLY ones he sports in Quantum of Solace,” quelling any rumors that he wore other colors or boot makers in the film. Interestingly, Bond always wears a black belt with his brown chukka boots. This is considered a faux pas by many, although it wasn’t the first time Craig’s Bond had done so; in Casino Royale, Bond wears a black belt with his brown chukka boots when he arrives in the Bahamas wearing a gray linen suit. Personally, I believe it’s more important that an outfit has a more consistent flow rather than sticking to arbitrary matching rules. Bond’s black belt nicely reflects the black top half of the outfit while the brown boots and socks soften the warm tones of the cream jeans. A stylish man like Daniel Craig knows how to dress, and the team of costumers outfitting him for the Bond series isn’t going to make a decision like that without thinking it through. If it looks good, it is good, and that’s the case here. The inevitable Omega on Bond’s wrist is the same Omega Seamaster Planet Ocean 600m Co-Axial Chronometer 2201.50.00 that he wears throughout Quantum of Solace. The 42mm case and deployment clasp link bracelet are stainless steel. The round dial is black with a 3:00 date window and luminous hour markers and hands. The specific number of Bond’s watch, which was auctioned by Christie’s three years ago for £34,850, is #81087613. This Omega is the only one that 007 sports during Quantum of Solace, a reasonable decision given his rogue status for most of the film’s short timeline. Disclaimer: Omega does not endorse breaking and entering. Bond’s sunglasses are also the same silver-framed Tom Ford TF108 aviators that we see throughout Quantum of Solace, worn with both suits and casual wear. These Italian-made sunglasses are on a semi matte rhodium frame with black temple tips and smoke blue lenses (19V). Okay, now I’m thinking the shirt might be blue. Dammit. Like the watch, Bond’s sunglasses were also sold at the “50 Years of James Bond” Christie’s auction in 2012 and fetched a decent £23,750, far more than the original $400 asking price. The Haitian scenes (and M’s reaction to them) establish Bond as more ruthless than we’ve seen him before, willing to kill on his path for both answers and vengeance. To be fair, M is a bit harsh when she criticizes Bond’s methods. He honestly has no choice but to kill Mitchell and Slate as both men were attacking him with deadly force in each situation. While the earlier Mitchell fight was a more traditional Bond-style battle with running, suits, guns, and exotic, setting-specific background action, the brawl with Edmund Slate in his room at the Hotel Dessalines is a dirty, violent fight more in the style of Jason Bourne than the Bond we’re used to. It makes sense that a 21st century agent would need to be trained for brutal hand-to-hand combat, and it’s a welcomed piece of realism unseen in the Bond series since the Orient Express melee between Sean Connery’s 007 and Robert Shaw’s Red Grant in From Russia with Love. For those interested in getting their hands on Bond-ian props, the knife that Slate uses when attacking Bond is a Masters of Defense (MOD) Harkins Triton Out-the-Front automatic knife, as identified by James Bond Lifestyle. The plain-edged dagger extends to 8.45 inches long when the double-action black tungsten-coated 154CM stainless steel blade is flipped out to its full 3.6-inch length. The handle is milspec-anodized aircraft aluminum. A less deadly device featuring in this scene is Bond’s Titanium silver edition Sony Ericsson C902 Cyber-shot cell phone with a slide-out lens cover and 5MP camera that Bond uses throughout Quantum to capture images of his foe to send back to MI6 for identification. More info about the tie-in phone available to promote the film can be found at James Bond Lifestyle. Bond’s Haiti casual attire is an easily adaptable outfit to be comfortable but look stylish in an informal situation, especially one that may include some unexpected action. Dark brown Church’s Ryder III sueded leather 2-eyelet chukka desert boots with Dainite® studded rubber soles. A very dark blue jacket and/or polo would probably also be a fine substitute for Craig’s black. Who knows… it may even be more accurate! Iconic Alternatives has a great rundown of affordable options to channel elements of this and many other 007 outfits, such as the Y-3 jacket and cream-colored Levi’s jeans. Bond gets his hand on Slate’s case before he leaves the hotel and discovers a photo of Camille with a Smith & Wesson M&P 360 revolver, a not-so-subtle indication that Slate was hired to kill Camille. No longer available on the market, the M&P 360 is a scandium alloy-framed snubnose revolver designed from Smith & Wesson’s small J-frame series and meant for lightweight and easy concealment. It weighs less than a pound when unloaded – 13.3 ounces to be exact – and conceals easily with a 1.875″ barrel. The finish is matte black with black synthetic rubber grips. Chambered for five rounds of .357 Magnum (or .38 Special +P) in its stainless steel cylinder, the M&P 360 would be a better choice for personal protection than for an assassin, especially since Slate’s weapon is already in a case and evidently not meant to be carried. Although “hammerless” revolvers are considered more practical for concealed carry, the M&P 360 with its exposed hammers offers a smooth, even trigger pull in both single-action and double-action modes, although firing the latter with the more powerful .357 Magnum tests the weapon’s accuracy (depending on the shooter’s stability, of course). This film was a disappointment after “Casino Royale”. Granted, CR had the benefit of Fleming source material, but “QoS’s” storyline was a warmed-over “Chinatown”. I did like DC’s wardrobe in this film, though. And, for once, Bond copied ME! I got my Planet Ocean 2201.50 a year earlier, grumbling over the opinion that the 42mm model is what he should have worn in CR. I think, also, that he may have had a couple of watches in the film, since I have a photo of another set-worn Planet O with a different serial number. I think the switch to the smaller 42mm watch might have been Daniel Craig’s idea, given that he owns a small collection of vintage Rolex pieces. Something tells me that he may have stipulated wanting to wear a smaller watch in this film, at a time when the big watch craze was well and truly underway. Oh, I like that QoS-Chinatown analogy… it certainly weakens Dominic Greene as a villain when placed next to the sinister Noah Cross. More power to Dan for opting to wear a 42mm rather than the BIG WATCHES that seemed to dominate everyone’s wrists. Thankfully, that fad seems to have gone away – at least around here. Since he’s saying he’s not sure if he’s up to doing another 007 outing after SPECTRE, perhaps EON will take notice and we’ll have our second Australian Bond? I’m sure you could put in a better effort than Lazenby! Yeah, the plot was pretty lukewarm, and Green was no threat to Bond, which is why he needed an axe at the end. Also, the first time we see Greene, he’s stamping receipts in some boardwalk store-room. A long way from Dr No and his secret lair. When I saw DC wearing the 45.5mm Planet Ocean in “Casino Royale”, I knew the big watch fad had well and truly taken hold. It all began around 2003, IMHO, when I saw Breitling and IWC release watches beyond 43mm in diameter. Watch sizing is ever-so-slowly swinging back a little towards more conservative (i.e.-classic) dimensions, but it may take two or four more years before things get closer (they’ll probably never go back) to how they were. Lazenby (still) has more hair than I do. My physique is ‘Jaggeresque’. So basically, I look more like Stipe than Statham. Although, I have it on good authority that I’m actually taller than The Transporter. I suppose that’s something. I can’t think of any Ausstralian actor who would be a contender right now. Jackman and Bana are getting too old, the Hemsworth brothers don’t seem right for it, and Sam Worthington is, I dunno, similar to the Hemsworths. Jay Courtnay? Nope. Too Hemsworthy. I’d like to see Michael Fassbender get the gig. He’d be “Flemingesque”. Interesting I can not find Levi’s 306 STA-PREST jeans on Amazon. There IS Levi’s Men’s Straight Chino Pant but they just do not look quite the same. I understand that sales of the STA-PREST shot through the roof once it became known that Dan Craig was gonna be wearing them in Quantum. I have two pairs of similar jeans, one from Express and another from the sadly defunct Martin + Osa. Both offer a similar look, although the M+O sacrifices a bit of the Levi’s structure for extra comfort. Good luck! Thank you for the heads up for an alternate idea. With summer coming would be cool to see a post about Bond’s casual wear like when he arrived in Cuba in Die Another Day. Thanks, Troy – your suggestion has inspired me to make this the focus of what will be the 00-7th of June post! Awesome. Will keep an eye out for it and will help spread the word. Since the Y3 jacket is nigh impossible to source these days I’m often on the lookout for alternatives that will provide a similar effect and look.